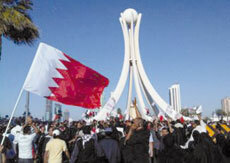 Discussions on the reform project in Bahrain have been ongoing for over a decade. Hardly a week passes by without government officials issuing statements stressing the importance of the rule of law and the Constitution, respecting human rights, complying with international conventions, transparency, freedom of expression and respecting the opposition. The reform project’s achievements include holding general elections, allowing a wide margin for freedom of expression and improving social services. All of these achievements were undermined when peaceful protesters were gunned down by the security forces. These incidents came as a great shock to most Bahrainis, who could not believe that these events were taking place in front of their eyes. Government officials realized from the beginning that a big mistake had taken place, and as soon as the King gave his condolences on 15 February 2011 to the families of two victims, another shocking tragedy took place. The tragedy was described by the Crown Prince in a broadcast speech, on 18 February 2011 as: “the most difficult day we have ever seen....what we have lost in these days is hard to regain, but I am convinced that there are sincere people working for Bahrain .... I don’t feel this is the real Bahrain, and I didn’t expect Bahrain to be in this situation.” He also added “we are at a crossroad; the youths took to the streets because they felt that they had no future in this country. Others took to the streets out of love and in order to protect this country, which belongs to everyone. It does not belong to the Sunnis or the Shia, it belongs to all Bahrainis”. Distrust is the main reason for the recent tragic events, which unfortunately has increased between officials and the opposition after the death of the protesters. It is very hard to build a stable political system without having the minimum amount of trust between the decision-makers and political parties. The Crown Prince was fully aware of this problem when he spoke to CNN on 19 February 2011: “my role is to build enough trust with the moderates in the country, so that we can transcend this problem; we nearly lost our souls, yesterday was a very difficult day”. The Bahraini Government admitted making a big mistake and the Interior Minister apologized on State TV and a day of national mourning was declared. We hope that this mistake will not be repeated and that problems are not resolved through the use of force or the street. Officials and monitors did not understand the details of the human rights violations that took place. For this reason, a committee has been set up to investigate the tragedy by the King. The Crown Prince said that he needs more time to assess the situation and that “what happened needs to be discussed, studied and understood”. The Crown Prince understands that there are hidden backgrounds behind the recent incidents. He did not condemn the protesters and did not say that they had no right to protest. He even did not doubt their intentions: “the protesters represent a very significant proportion of our society and our political beliefs and we will ensure their safety” He also said that the 19 February 2011 demonstrations were held with good intention. **The need for deep reforms: there is a general feeling that deep reform of the political system is required. Public demands and expectations have sharply increased because of regional developments in Tunisia, Yemen and Libya, which are radically reforming the region. Furthermore, we believe that this is the right time to revitalize the reform project by taking big steps and introducing constitutional and administrative reforms. The Government supports reforms but they must take place through dialogue. It announced its readiness to discuss all issues without any exception. On 27 February 2011, the Crown Prince said: “all issues should be put forward for discussion on the national dialogue table; there are no red lines.” On the other hand, political parties put pre-conditions before entering into dialogue with the Government leading to its postponement. Some parties rejected the very idea of dialogue and are pushing towards civil disobedience. However, the majority believe in reform, reject sectarianism, avoid confrontation with the security forces and refuse to damage the public interest. There is concern that the opposition will lose control of the street just like the Government. In their recent statements, political societies called for calm and condemned the irresponsible behaviours, which prevented students from going to schools and what took place in the Financial District. On 22 February 2011, the Government represented by the King said that: “public squares are not the suitable place for national dialogue. The most suitable place is the national dialogue table.” The Crown Prince immediately called for calm and said: “We cannot continue living in chaos for days”. He expressed his concerns saying that: “many countries went through civil wars and fell apart because wise people did not say ‘enough’. 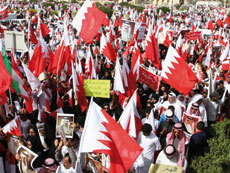 Bahrain has never considered itself to be a police State. Mistakes were made, political posturing took place and we changed ourselves. 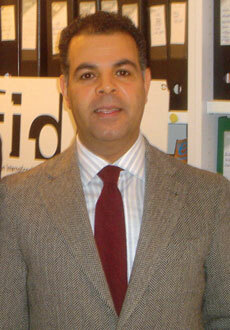 Today we are at a crossroad, and I will not accept that our sons are fighting each other” (18 February 2011). Political parties used the street to exert pressure on the Government in order to get political concessions. Seemingly, the Government partially gave in to their demands. However, the continuous use of the street will lead to further deterioration of the situation, especially since a new Sunni protest is beginning to emerge and express itself in public squares. In order to keep the situation under control, Bahrain’s political structure needs to change in order to avoid social divisions and sectarian schism. We believe that the right moment to engage in national dialogue has arrived.